Taxi drivers will finally be allowed access through a controversial Aberdeen bus gate in the coming months. There has been growing frustration among the ranks as councillors had originally agreed in principal to allow cabs through the Bedford bus gate in November 2017. But it has now emerged that following a public consultation in December, which resulted in no objections being received, council officers can push ahead without further approval from a committee. All that is needed is new signage, expected to take between six and eight weeks to install, before taxis can begin using it. The move should speed up journeys and make parts of the city more easily accessible to the taxi trade. It should also be welcomed by passengers who should enjoy cheaper fares to some parts of the city as a result. Bus gates – usually short sections of road – are commonly blocked to all traffic except buses, cycles and taxis, but the Bedford example has to date restricted that even further. It is expected to open to taxis for the first time before the end of the financial year in April. 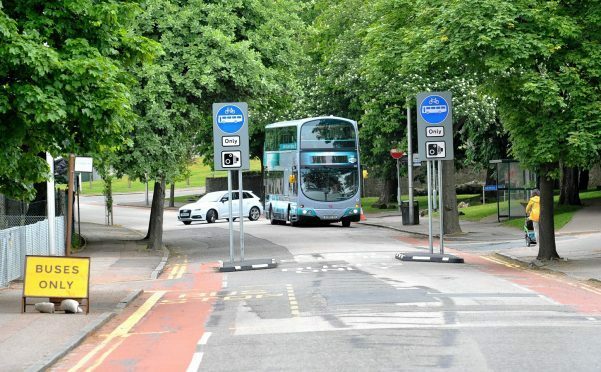 Council transport spokesman Ross Grant, a councillor for Tillydrone, Seaton and Old Aberdeen, said: “I’m pleased to see that, following the agreed extensive consultation, the proposal to allow taxis through the Bedford Road bus gate will now be implemented. The gate was installed in May 2016 to stop drivers using Bedford Road as a through road after the Diamond Bridge opened. The move prompted outrage among many drivers, with a petition against the gate gathering almost 3,000 signatures in 2016. It has also proved to be a valuable money spinner for the local authority– raking in almost £685,000 in fines in its first year.